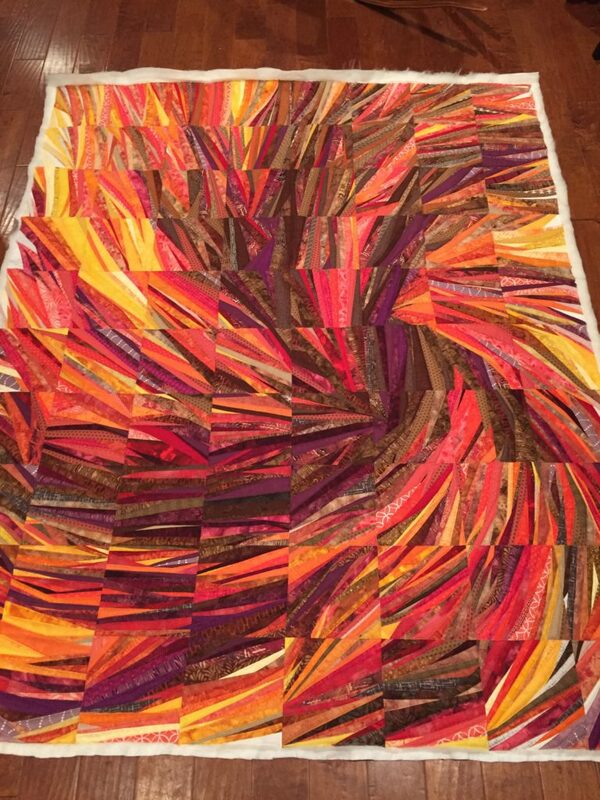 This is Part 2 of 3 about my current favorite quilt that I’ve made, “Fusion,” pictured below. I made it in 2017, after letting it percolate for about 18 months. If you haven’t read Part 1 of this series, it’s going to seem like I’m starting in the middle. So go here and read that first — I’ll wait. 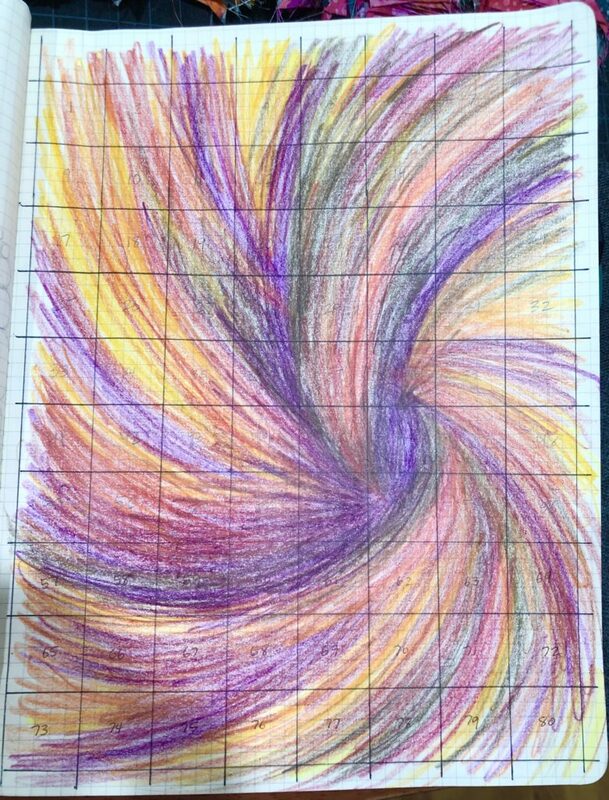 In late evening one night in March of 2017, over a year after Dad’s heart surgery, I was packing to go on a school trip and suddenly had a compulsive need to sketch out the complete design idea for the quilt. There used to be a page in my Facebook profile where I collected favorite quotations… it has been swallowed up by webgremlins because I can’t find it, and I can’t remember enough of the quotation I want to mention here, but maybe one of you will know it. Basically, it’s suggesting that when you make art (and I think the originator was talking about composing music, but to me it’s the same), it’s because the act of not making the art is no longer tenable. I HAD to pick up my pencils that night, and even though I was tired after standing all day, I was so moved to sketch this out that I stood up for almost two hours getting it drawn. I could have taken my pencils to the kitchen table and sat down, but the idea flood was coming so fast I didn’t want to even take a break for that… So I just kept sketching. After two hours and increasing “ahems” from Jerry reminding me that I had to get up really early the next morning, I had drawn this in my large Moleskine cahier journal. I darkened the one inch grid lines and numbered the squares later. 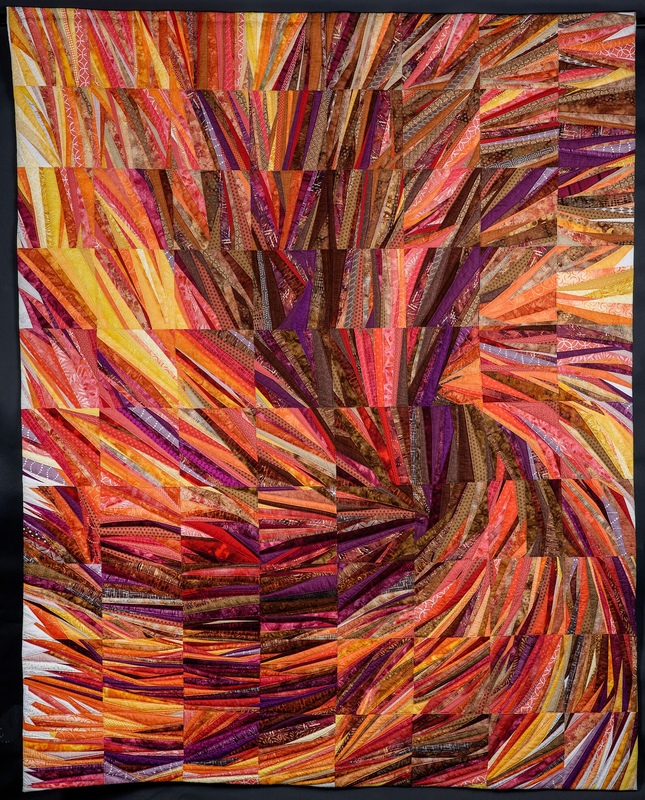 I went on the trip and dreamed about this quilt idea, looking forward to coming back and working on it. But the more I daydreamed about it, the more I realized that I didn’t need to be dealing with the fractured thinking that the school year causes while I was trying to work through this piece. 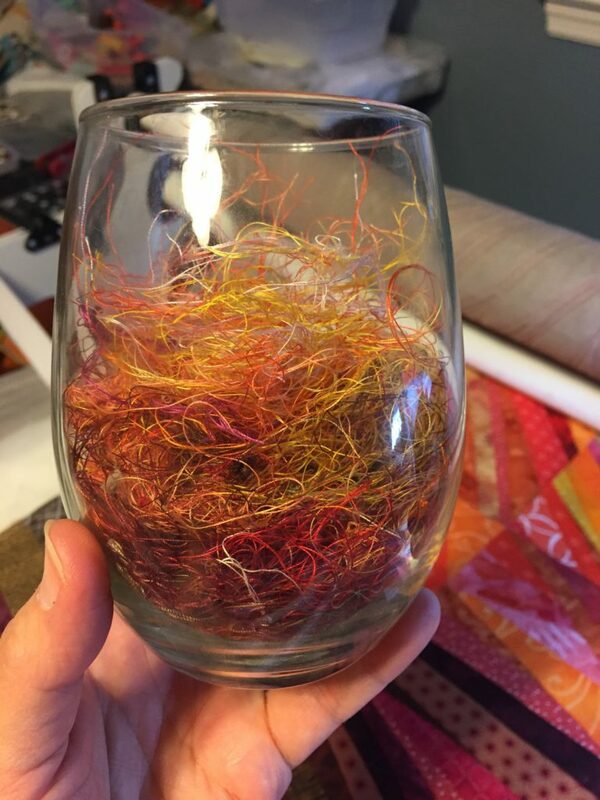 So I just let it marinate for the rest of the spring, pulling the fabrics from my stash and collecting them in a Sterilite bin. As soon as graduation was over, I eagerly began construction. 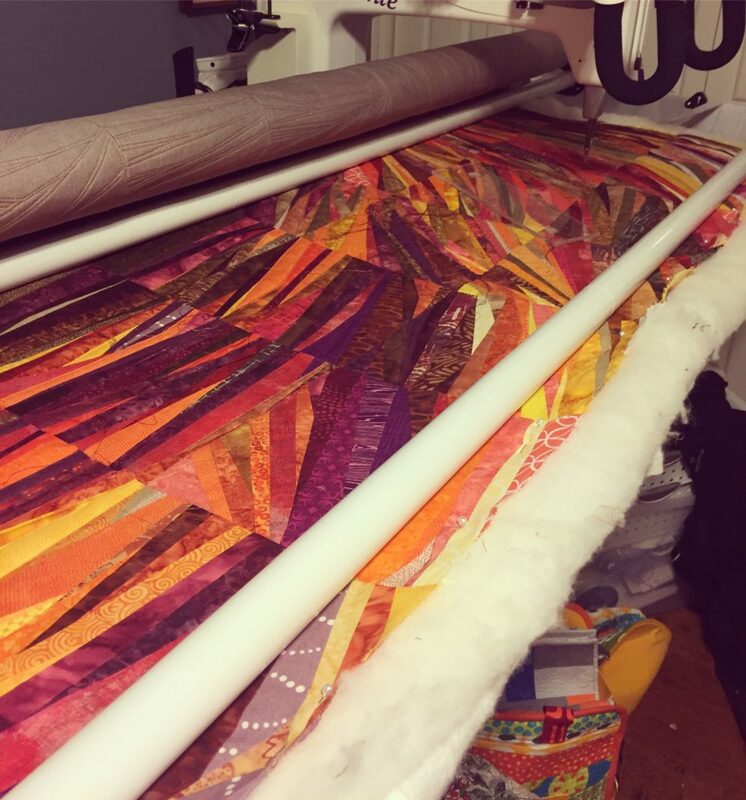 I cut 2.5″ strips of all of these fabrics, and piled them up on my table, working to assemble the colors in the same organic manner as in each block of the sketch. I did not use foundations to assemble the blocks, relying instead on spray starch and firmly pressing every seam before I trimmed and added the next piece. 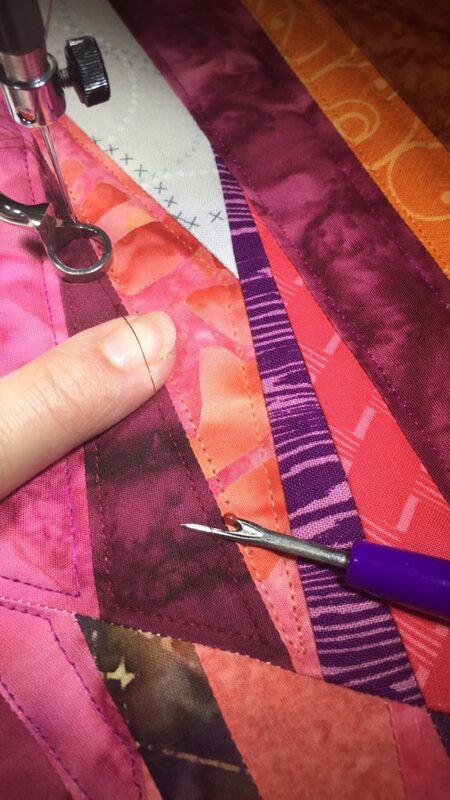 Sometimes I’d get the angles a little weird and would have to trim off a section and begin again, but I rarely used my seam ripper to fix errors; I just would trim more and try again. 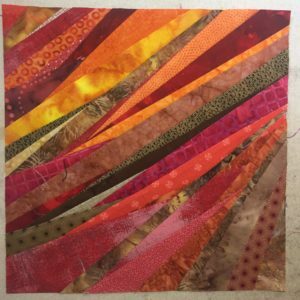 I also decided that any non-solid quilting cotton was fair game to use in the piece, no matter what genre of fabric was touching it. 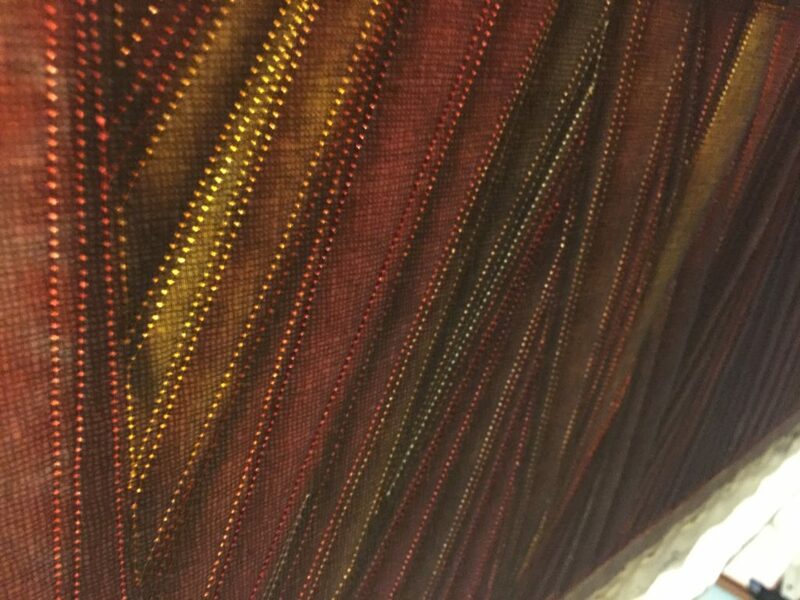 This meant that batiks danced with modern fabrics, and Thimbleberries mingled with hand-dyes and tonals. I expected to be struck down by Zeus himself because the! very! idea! 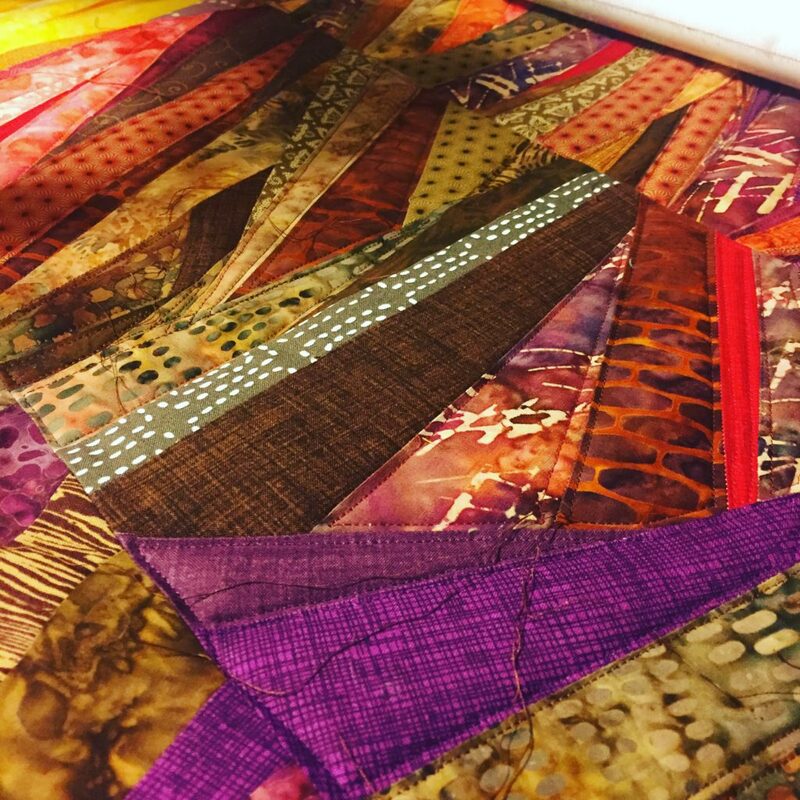 of mixing batik fabrics with modern fabrics was enough to make some quilters hyperventilate about my heretic behavior. No lightning came through my windows, so I kept going… Soon I had the top row fully assembled. This is either going to be really cool or a SPECTACULAR waste of fabric. Occasionally the experiments end up being the latter, but usually if I can persist I find that they’re the former. The key is to push through the doubt when I start to hate it, and I’ll always start to hate it. It’s part of the process, and the part where most people get stuck and quit. I probably squealed when I got the first few blocks of the second row done. 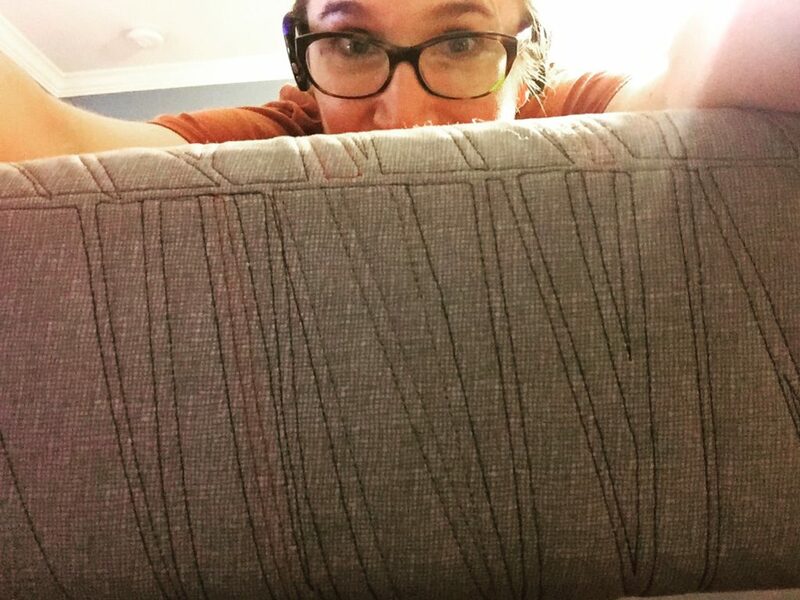 When I had more of the second row finished, I knew that this was very definitely going to work, and it was going to be even better than I had imagined. In the photo above, you can see that there are gaps in the blocks that have been finished and assembled on the wall. This is because I decided to work on two non-consecutive blocks at a time, so that a block wouldn’t inform the block next to it in design or fabric selection. 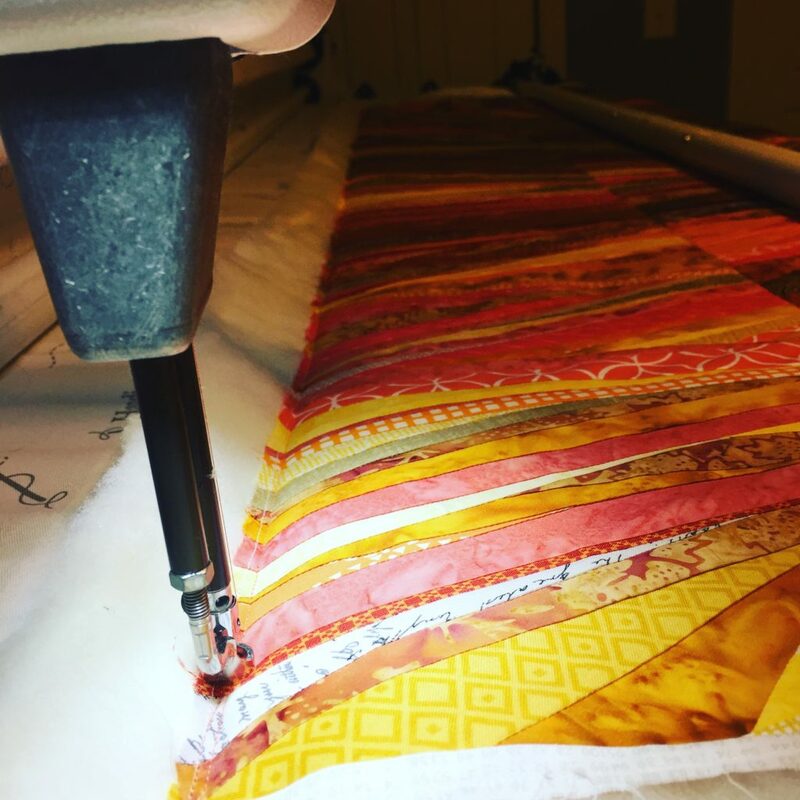 I knew that I had very limited quantities of some of the fabrics I would be using, and I didn’t want to have to worry when I couldn’t find a fabric anymore — and some of these fabrics had been aging on my shelves for almost 2 decades. I also didn’t want to feel discouraged from using any fabric up completely. Didn’t I buy it to use it in the first place? 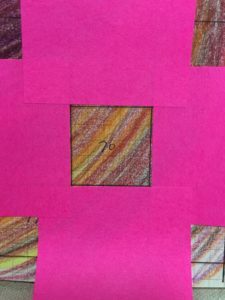 My process was to use Post-it Notes to cover all of the surrounding blocks, so that I could only see the block I was working on. Because of the size of my Post-it Notes, it was best to work on the blocks that were 3 apart. In the photo below you can see the marked sketch and the two visible blocks. 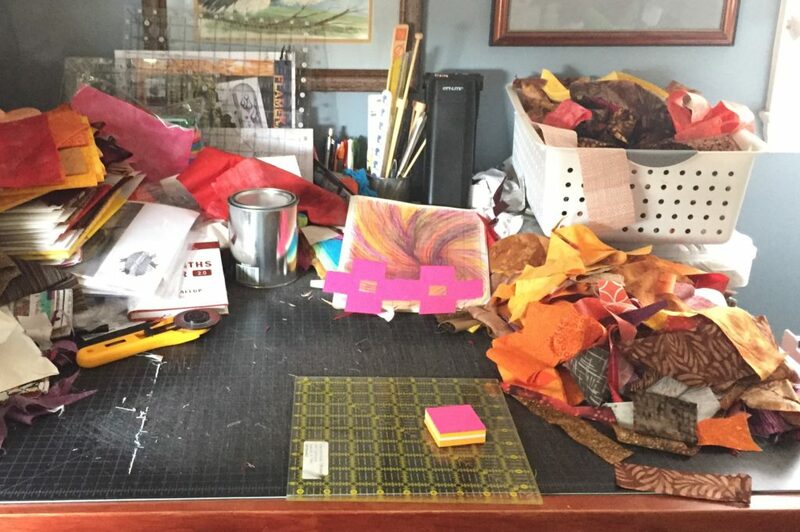 I’d usually work until the shreds of fabric had so encroached my workspace that I was struggling to find anywhere to work, and then I’d clean up until I had about a 16″ square of workable area again. 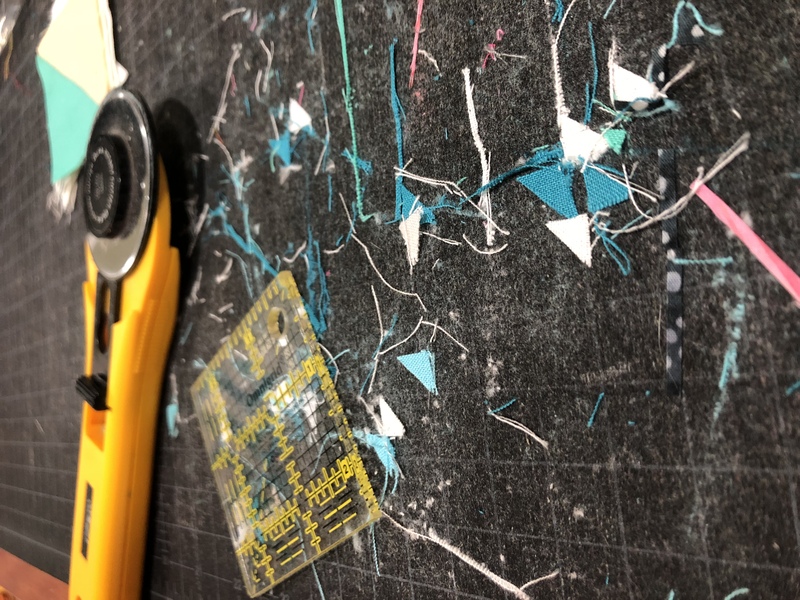 This was right after a big cleanup session, as evidenced by the minimum of tiny shreds of fabric littering the left side of the cutting mat. I referred to the sketch constantly to know what color fabric to choose next, and to get the angle on the last piece attached right — and to be sure to include enough seam allowance when I trimmed that I didn’t lose the last colors added. Above are block 70 from the sketch, and block 70 from the quilt. 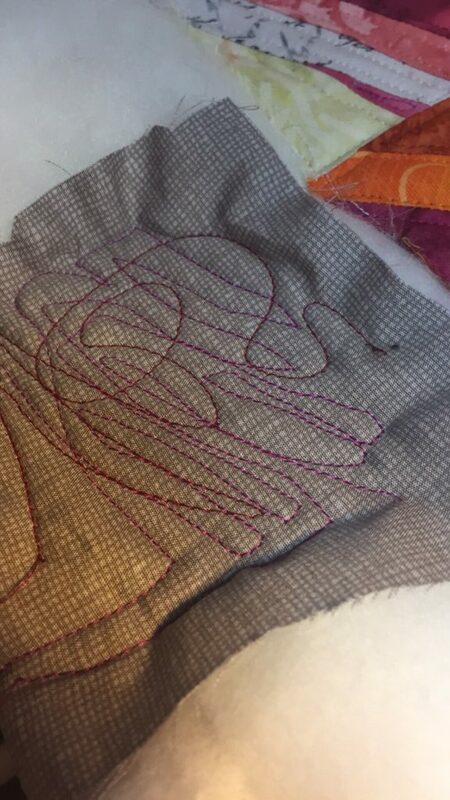 The fabric version wasn’t a perfect duplicate of the sketch, but I decided that I liked the fracture lines caused by these types of imperfection. It took about a day to assemble two blocks, and more if I made mistakes that I had to trim off and redo. After I had two rows totally finished, the girls and I drove to Virginia for cousin Lauren’s high school graduation in the middle of June. 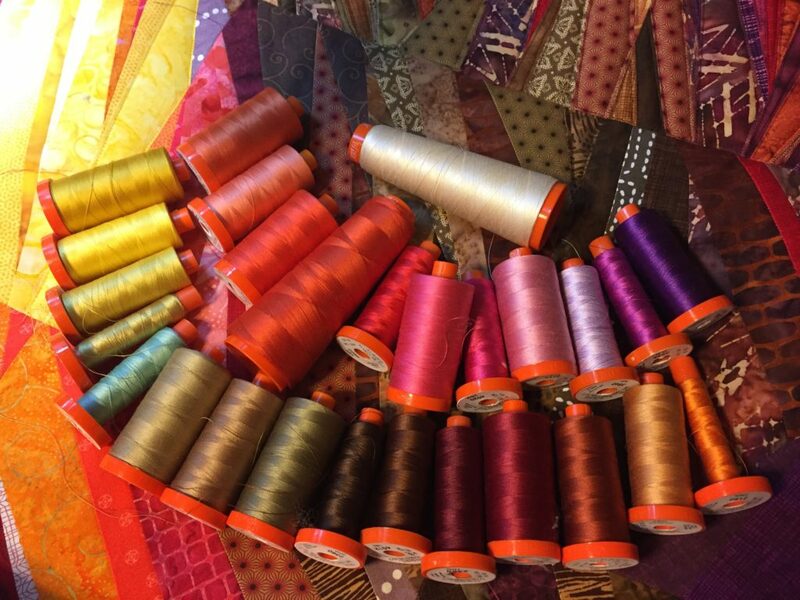 We stayed in Wytheville, VA on the way up, and I bargained with the girls about fabric shopping at Sew What Fabrics, which is one of my favorite fabric stores in the world. They allowed (ha!) me to go as long as I picked up breakfast for them on the way back and didn’t stay longer than half an hour. 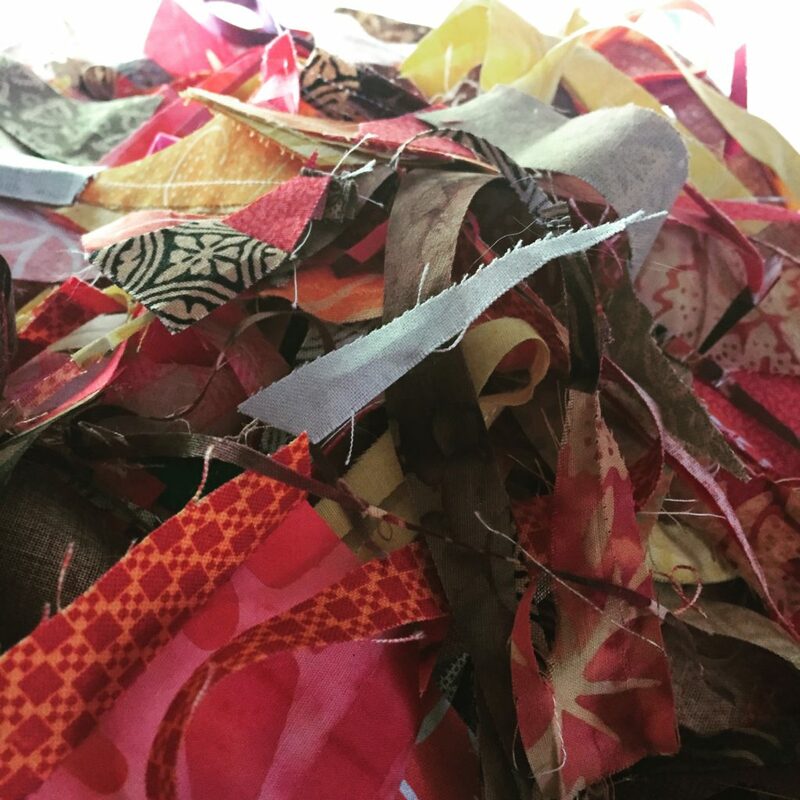 Turns out you can buy a LOT of fabric in half an hour. 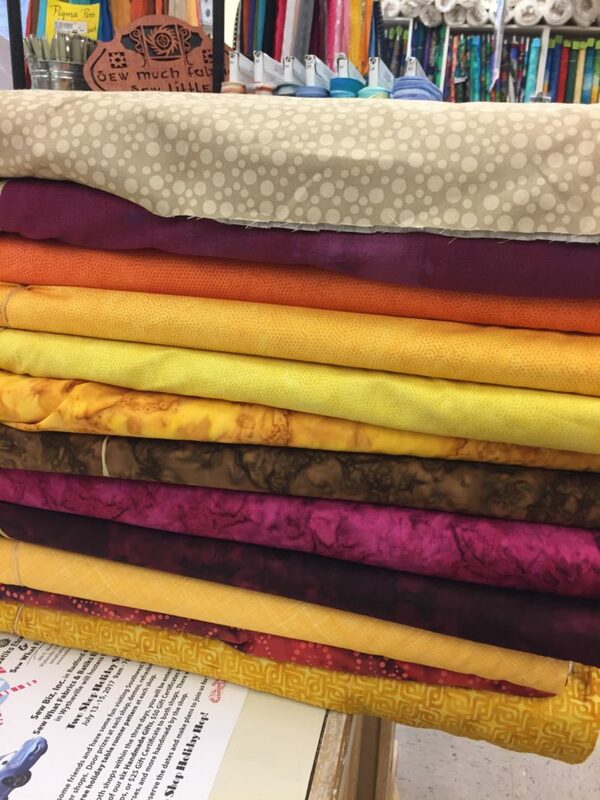 And this doesn’t even count the fat quarters of brown Civil War fabrics that I found… I don’t even remember how many of those there were, but it was good handful. 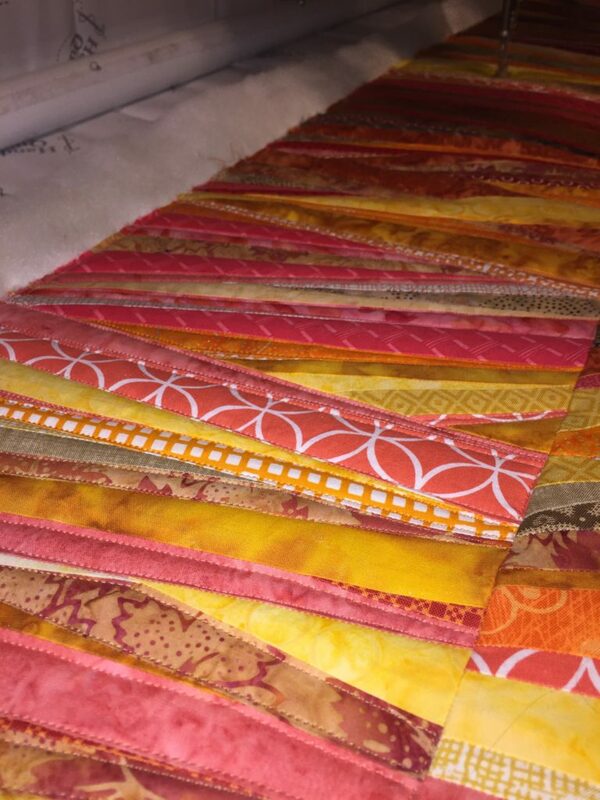 I had pretty much run out of yellows and browns and maroons, and I still had 80% of the quilt remaining to assemble, most of which would need brown and maroon. I told Helen I spent $11.00. I didn’t tell her the multiple of $11.00 that I spent, but she’s well aware of how much fabric costs so I’m pretty sure she was over there judging the stack and making calculations, preparing to rat on me to her daddy… who, as long as I use it up, really doesn’t care that much when I buy fabric. 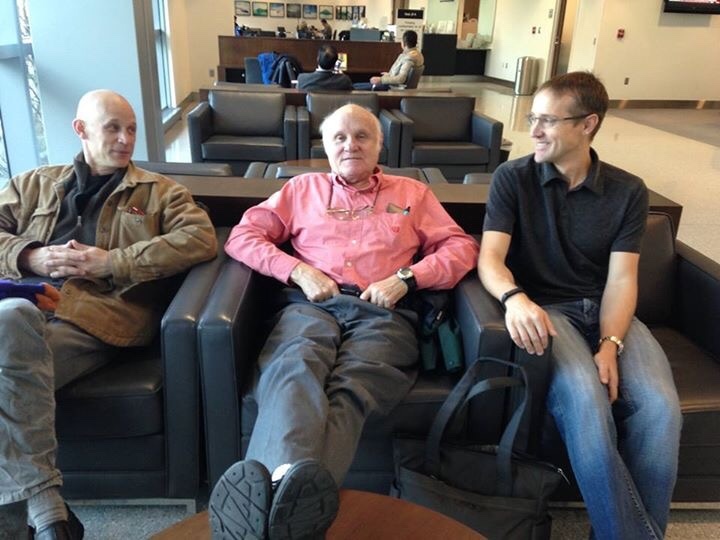 In Virginia, we noticed that Dad was coughing a lot, and was grumpier and grumpier again — like he had been 2 years before. His coughs were dry and unproductive, and just sounded like they hurt. He’d get winded just walking around my brother’s house, and kept taking long naps. We just rolled our eyes and barked back at him when he was cranky, but something wasn’t right. He insisted he was fine, and at his annual physical appointment that week his doc had also said he was fine. After our weekend in Virginia and safely back home again with the newly restocked yellows and maroons and browns, I kept working on assembling the rows. 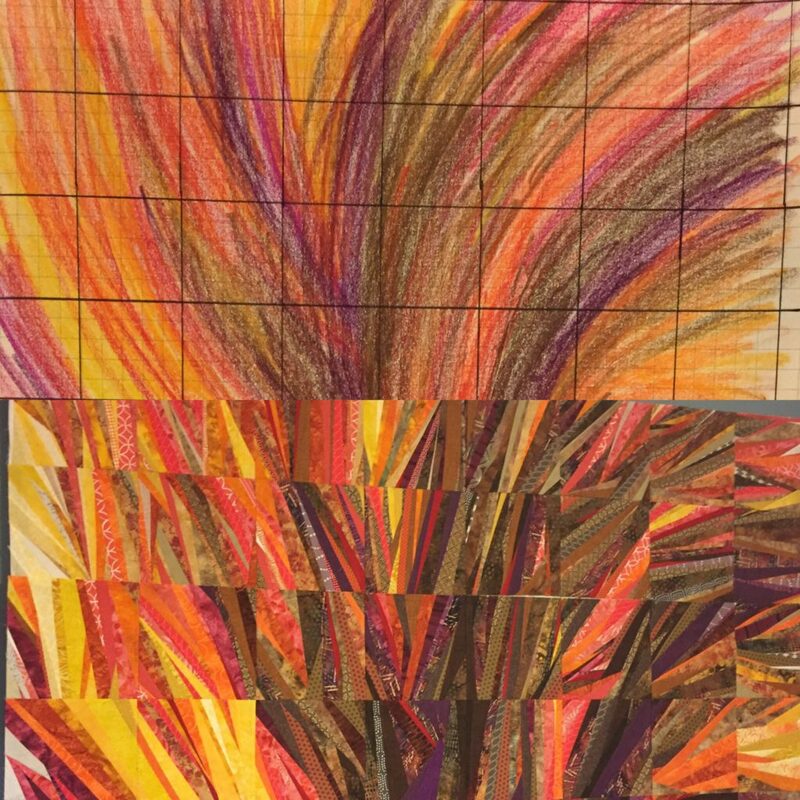 I’d post progress photos on Instagram and people kept suggesting that it looked like a fire. 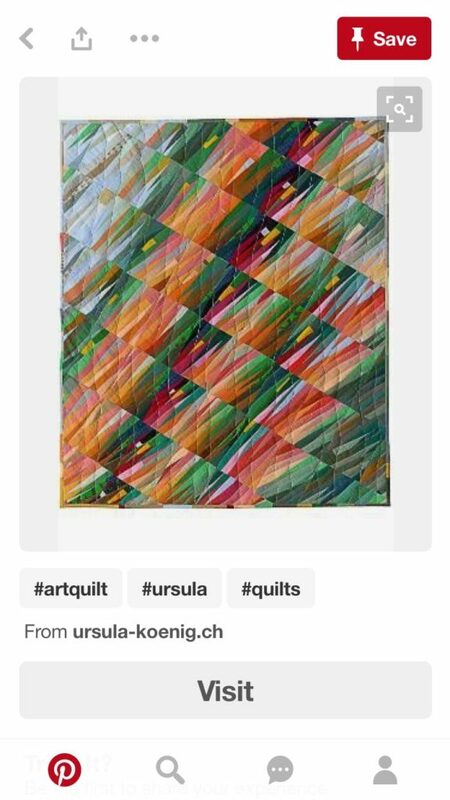 I didn’t confirm or deny what it represented for me, but the working title when Jerry and I would talk about it was “Arterial Spray.” We decided that perhaps that wasn’t a good name for a quilt, because it might invite questions. Lots and lots of questions. I might watch too many crime TV shows. Perhaps. 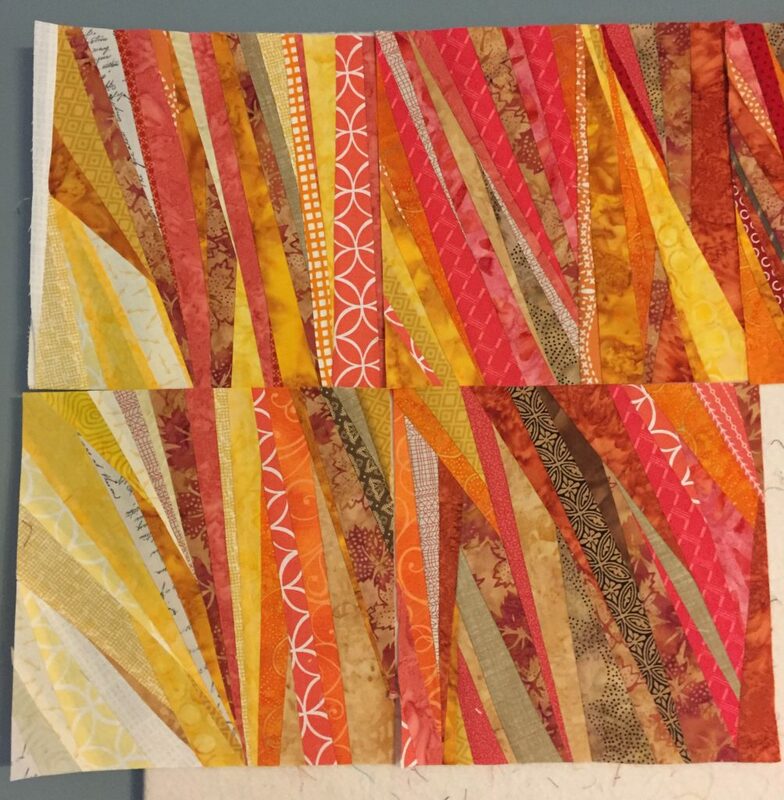 I did finally post a photo of the first four rows of the sketch shown with the first four rows of the quilt, and the response was HUGE. “DO YOU TEACH CLASSES IN THIS!? 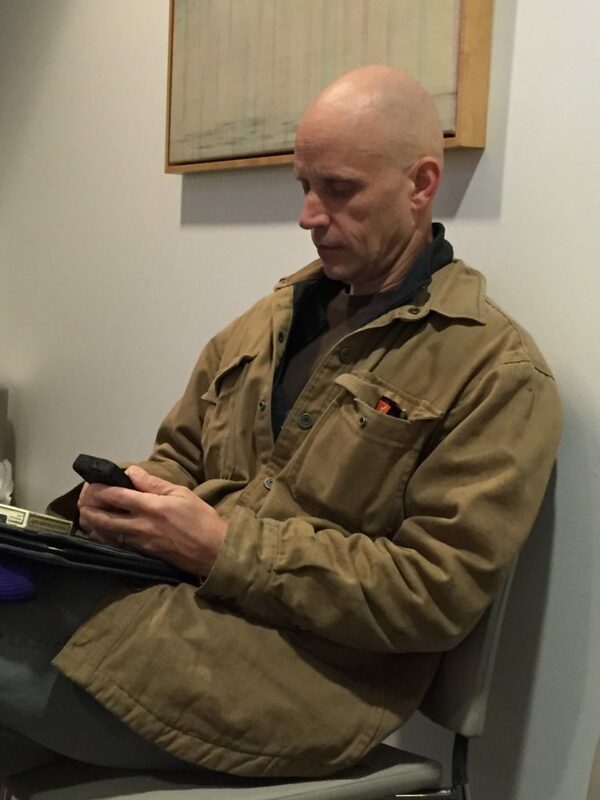 !” Um, I’m figuring out what the heck I’m doing at the moment… lemme get back to you on that. After I had 5 rows finished, I considered stopping… But I wasn’t out of fabrics yet and I had JUST spent $11.00, so I kept going. I ran out of design wall, but I kept going. 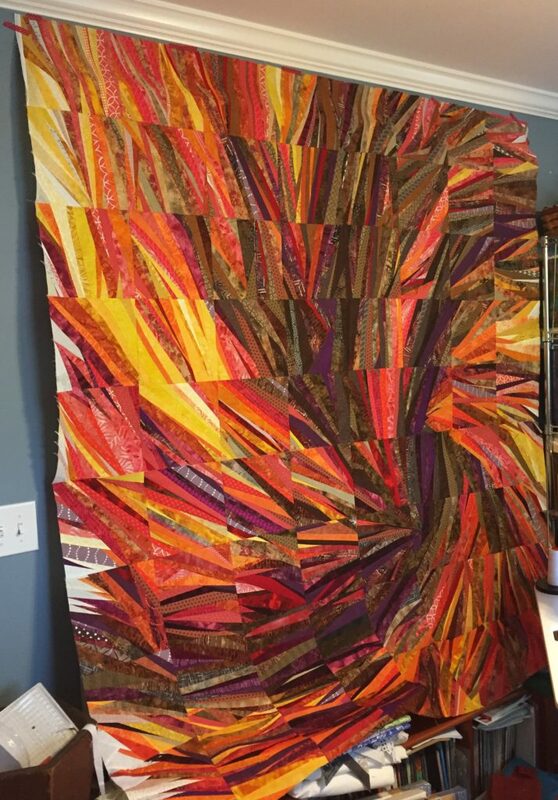 When I finished the piece, it extended two feet below my design wall and weighed more than most of the quilts I make. There were three cans of starch stabilizing everything and well over 2500 individual pieces of fabric sewn together. Yes. I counted. Well, sort of. There are 252 pieces in the top row. As I got more comfortable with the process, the blocks got a lot more complex and had more pieces in them, and there are ten rows. So I know that there are more than 2500 pieces in it. 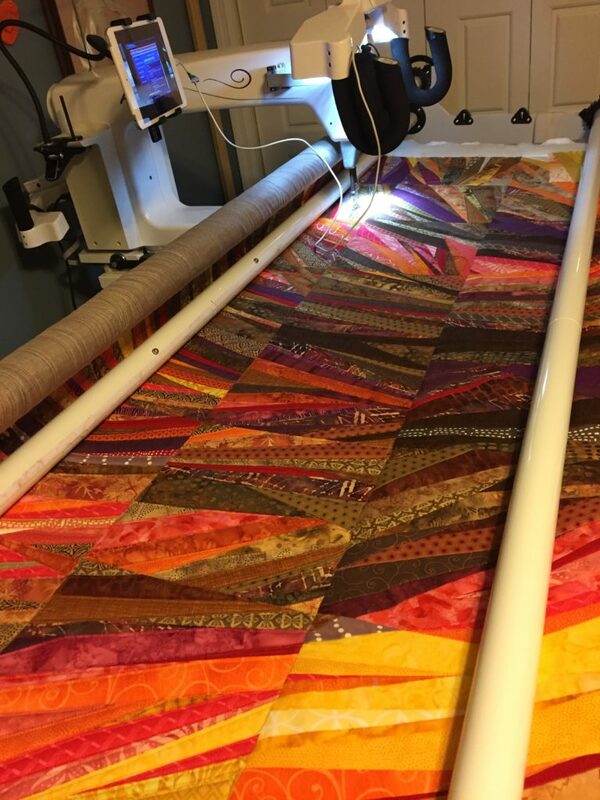 I couldn’t even get a photo of the entire thing without hanging off of the ledge over our foyer, but I was in too much of a hurry to get it onto my longarm quilting machine to take a good photo. By now it was August and I was about to have to go back to school. 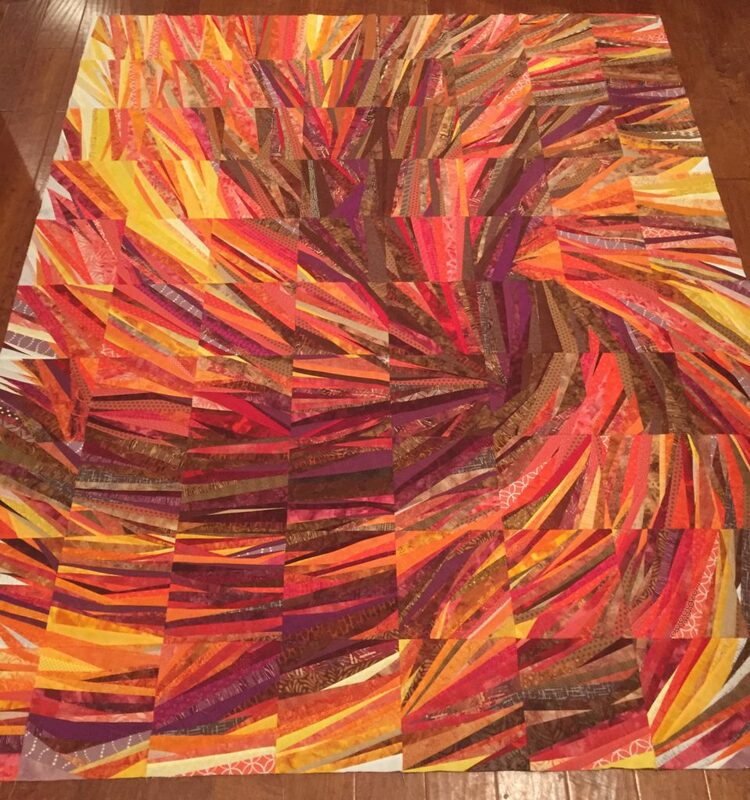 And our local guild’s biannual quilt show entry deadline was in the middle of August, so I needed to have a photo of it for color references in order to enter it into the show. 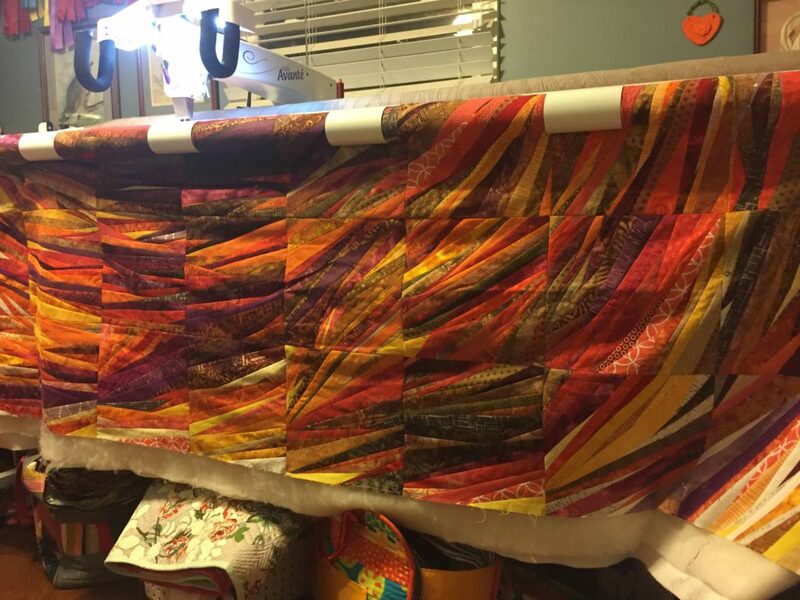 To do the quilting justice, I also knew I was going to need as much of the remaining two months as possible to get it right. 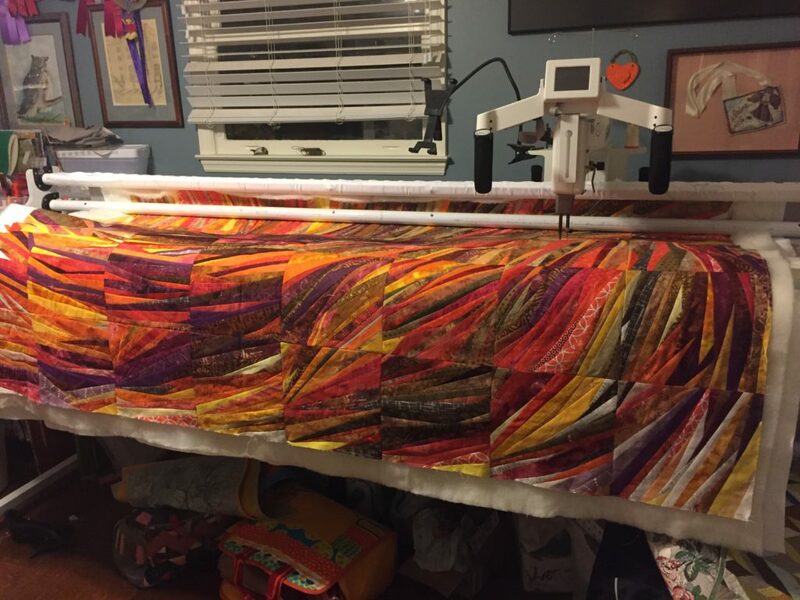 I eagerly loaded the quilt onto the longarm machine with a layer of cotton and another layer of wool batting, basted the top edge to hold it in place, and chose my thread colors. Mom and Dad had just come back from an RV caravan trip to Albuquerque, and their friends again had expressed concern about Dad’s declining ability to keep up. So they went to the doctor again, who said that this time he heard something weird when Dad was breathing. He was sent for a chest X-ray and CT scan. We waited for news and I went back to school for the faculty in-service training. 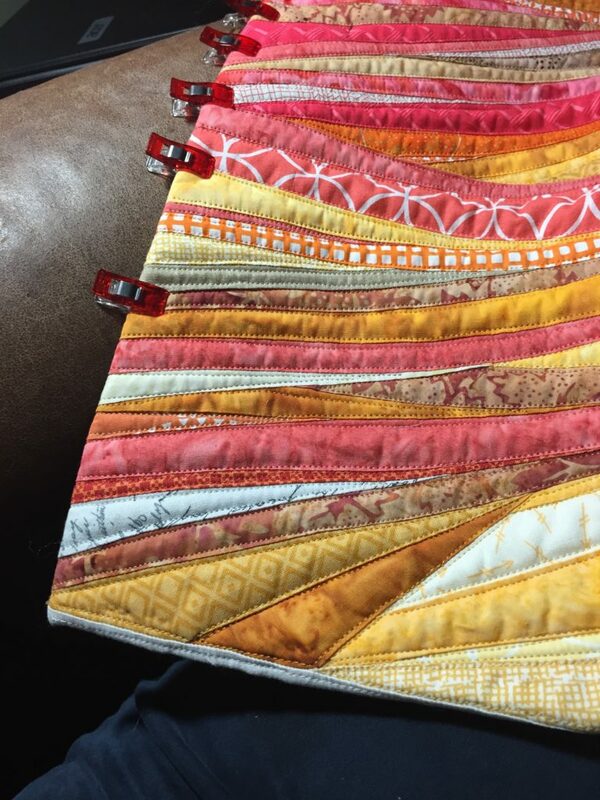 Suddenly this quilt had a much more important job to do, and its timeline was even more critical. 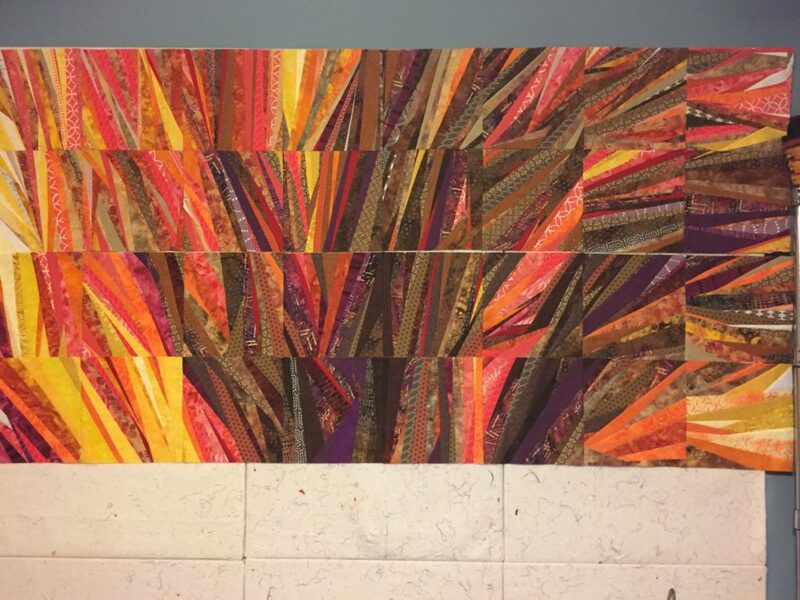 Two things I knew for sure: I needed the therapy that would be provided by having this creative project, and I needed to finish it before Dad left or I would never finish it at all. 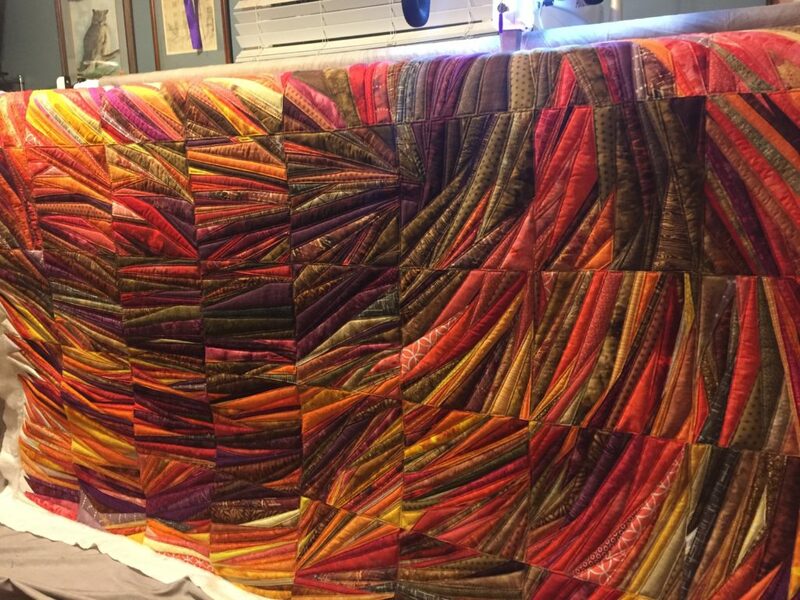 Ideally, I wanted Dad to see it finished, since he was the original inspiration behind it, but I didn’t know what his prognosis was and how long it would take me to finish the quilt, so I couldn’t even guess if that was possible. 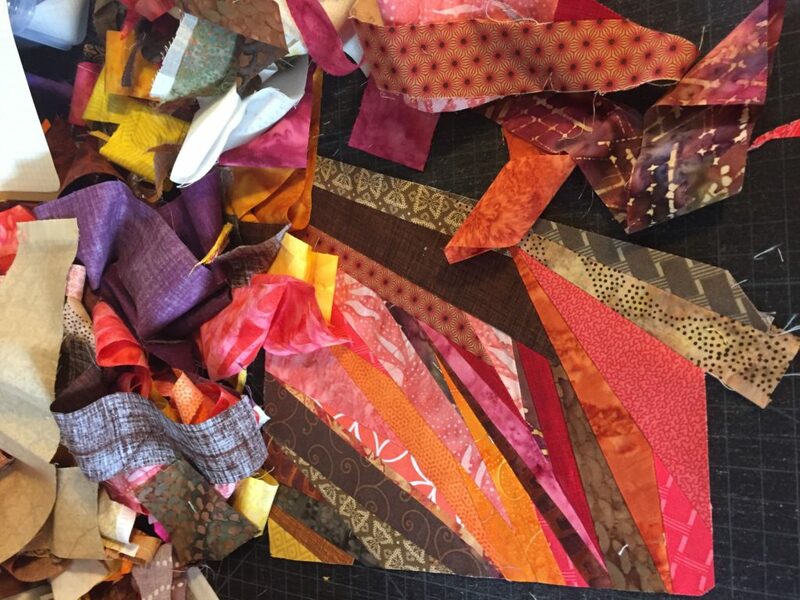 In Part 3 I’ll talk about the quilting process on “Fusion,” as well as the process of saying goodbye to my Daddy. Part 3 may take me a while to compose, but I’ll try to do it soon. 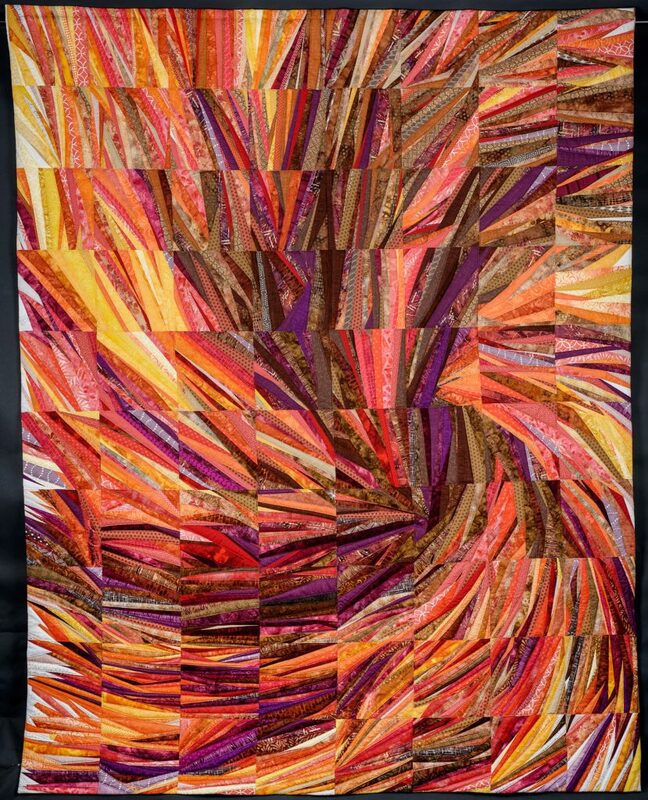 This is Part 1 of 3 about my current favorite quilt that I’ve made, “Fusion,” pictured below. I made it in 2017, after letting it percolate for about 18 months. 2015 was a rough year for my dad, who was slowing down but wouldn’t really address why he didn’t feel well. Doctors are the worst patients, after all. He just progressively got grumpier and less able to keep up with Mom on their travels, until finally on a cross-country RV caravan some of their friends said something to Mom about his decline. She made an appointment with a doctor to have Dad checked out, and essentially dragged him kicking and screaming to the appointment. 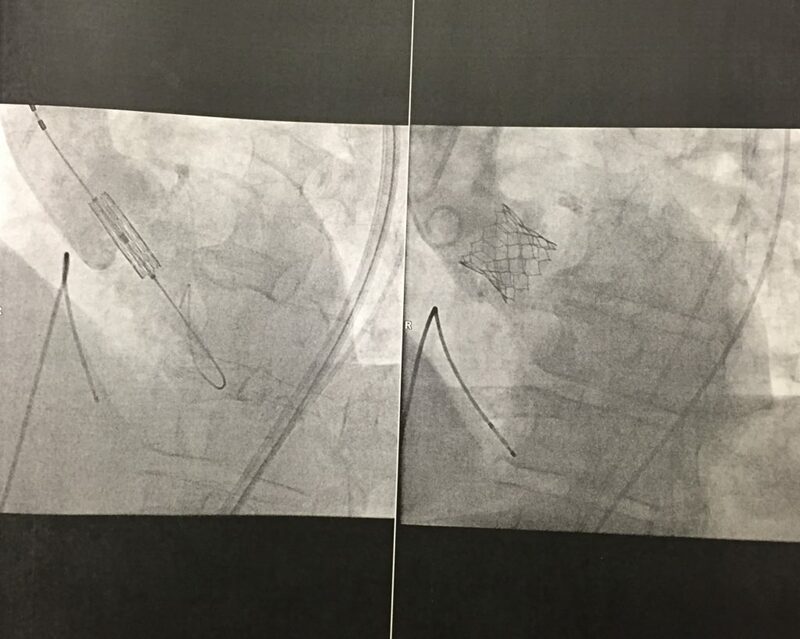 The doc sent dad to a cardiologist, who did a heart cath and saw that Dad was dealing with severe aortic stenosis and porcelainization of all of the vessels around his heart. They inserted a stint to buy time, and sent him to a cardiac surgeon. The cardiac surgeon recommended a TAVR procedure, but said with the level of porcelainization he wasn’t comfortable doing it here in town. While he had done around 20 TAVRs in his career, he felt that Dad would be better served in a facility that did 20 of them in a given day, because they were better equipped to deal with all of the issues that might arise. That was in August, so after research of the best facilities and surgeons, referrals, appointments back and forth, the surgery date of December 7 was chosen. My brothers leaned on me to prevent Dad from doing our usual out-in-the-woods camping trip for Thanksgiving, since he was a ticking time bomb; if Huntsville wasn’t equipped to handle his heart issues, rural Virginia very definitely wouldn’t be. Dad was mad as hell at me for insisting, but once he knew that Pete and Tom were on my side, he caved and we stayed local for Thanksgiving. 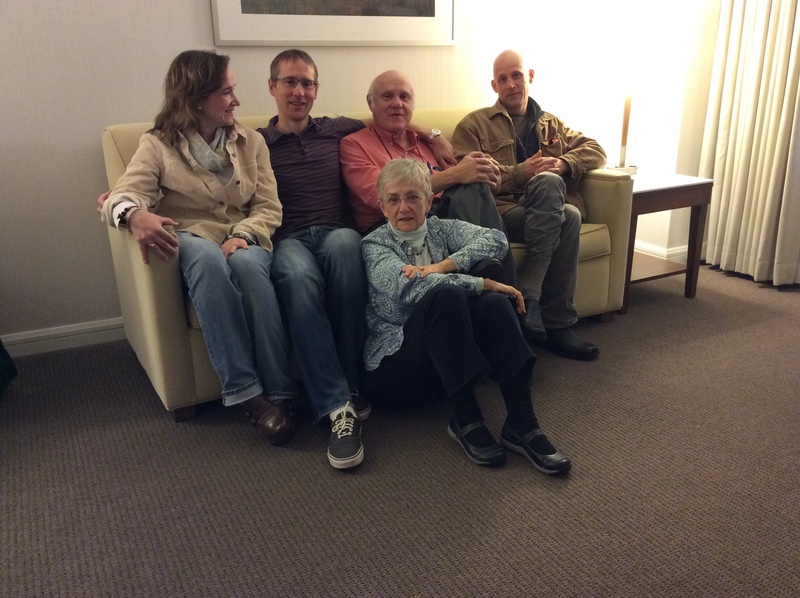 Dad’s surgery was at the Cleveland Clinic, and our nuclear family was all there. Mom and I stayed in a little apartment hotel around the corner from the main hospital, set up for the families of patients in critical care. Pete and Tom were at a hotel about a mile away. 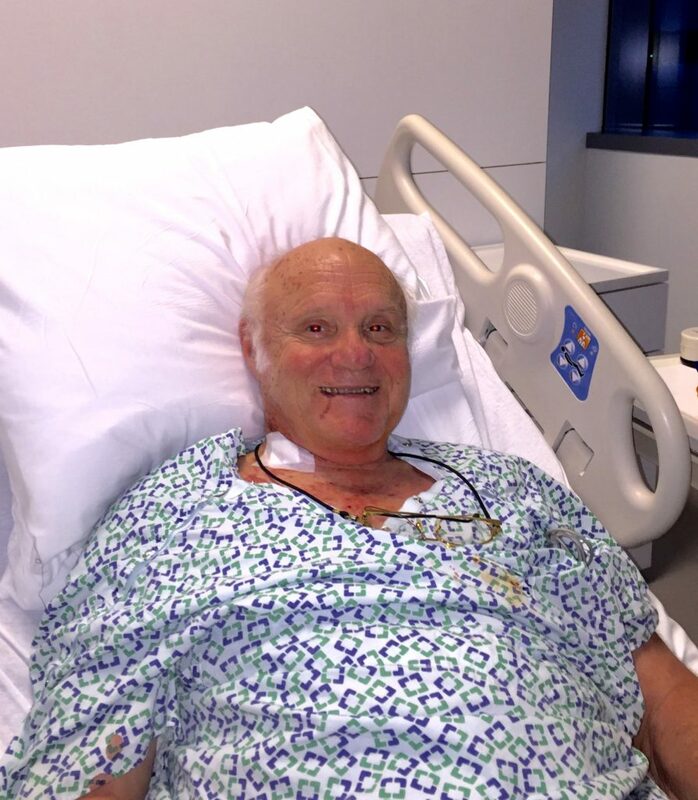 This picture was taken the morning of the surgery, just before we checked him in. Dad was so pale, even for a white-haired Scandinavian guy! 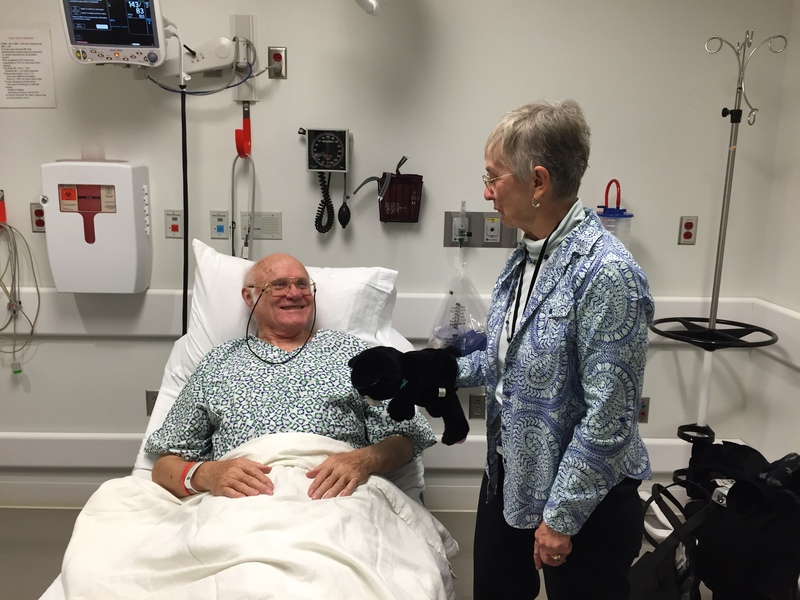 Mom brought “Houston,” the cat puppet that Dad used to calm his own patients at the hospital, and gave Dad a cat scan before they wheeled him back. He laughed nervously and they took him back. Mom wore his wedding band on her thumb and we all waited anxiously in the waiting rooms, praying that all of the codes we could hear being called weren’t for us. 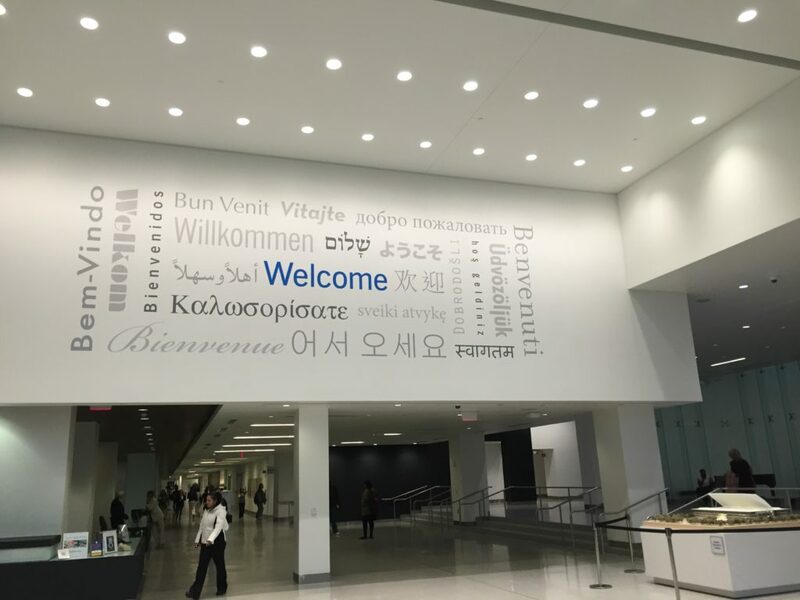 There’s lots to do at the Cleveland Clinic, which does not feel like a hospital at all. There are people from all nationalities wandering around, shops and restaurants scattered around, and art installations and musical performances constantly. 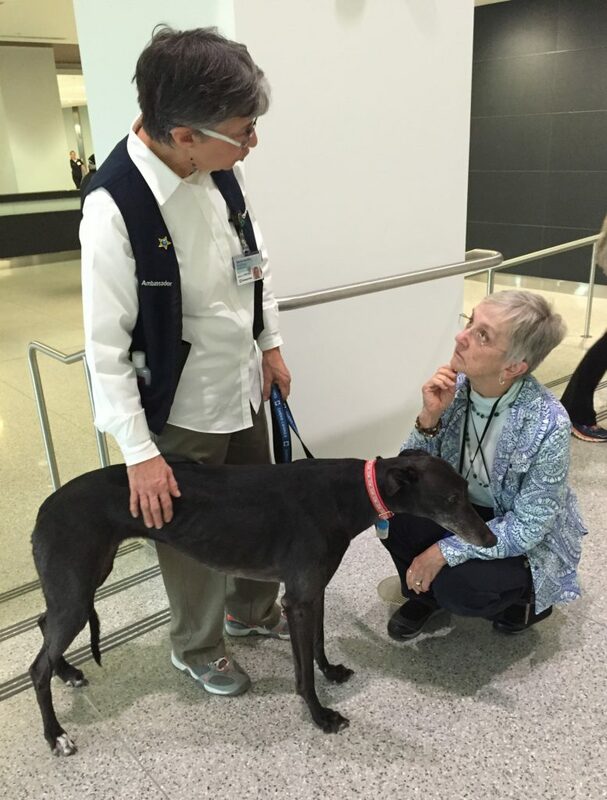 We met therapy dogs and listened to music and waited. We only waited a few hours but it felt a lot longer than that. 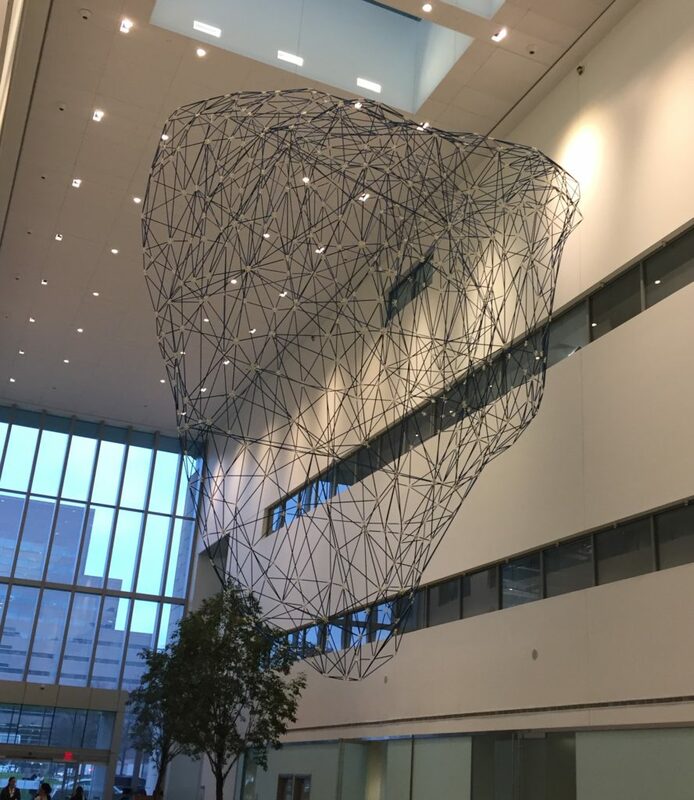 When we were finally called upstairs to the post-op waiting area, we met with the head surgeon and his lieutenant, who said that everything had gone very well and we could see him soon. The image above is of the artificial valve, before and after it was opened up. 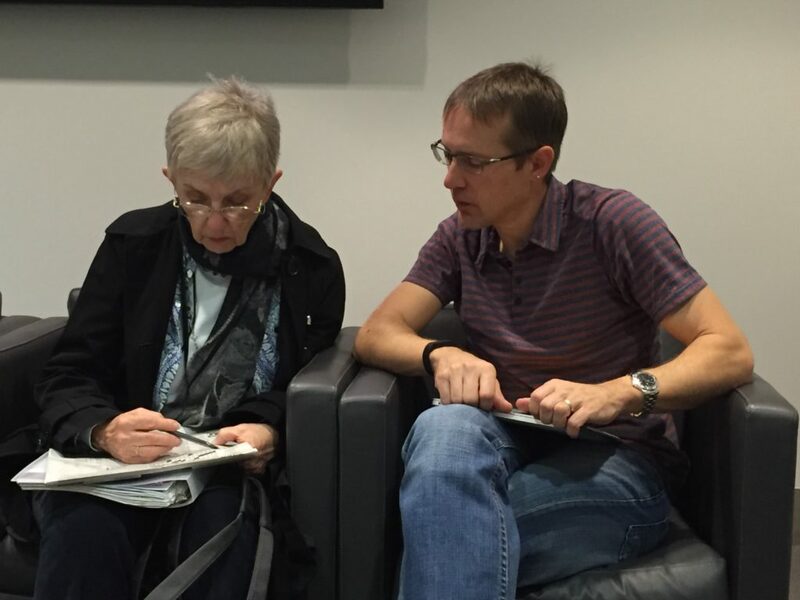 Then we were sent to a surgical ICU waiting area, and we could go back two at a time to see him. 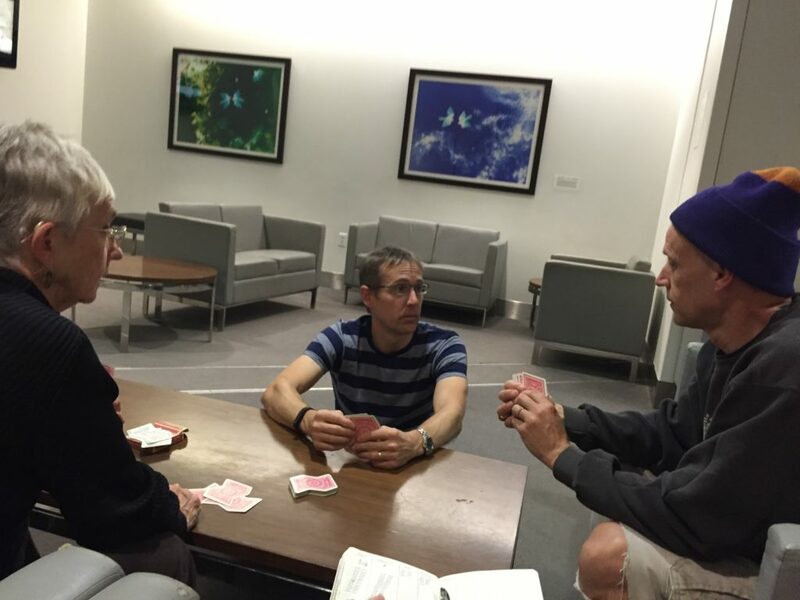 We spent a lot of time in that waiting room playing cribbage. Dad had a dedicated nurse at the foot of his bed that night, and we were a little concerned that she would get pushed around by him because he was so hangry by then. Apparently this wasn’t her first rodeo so she was just fine. When he demanded her stethoscope so he could listen to his heart, she raised an eyebrow and barked back at him, “I believe that you forgot how to ask properly. 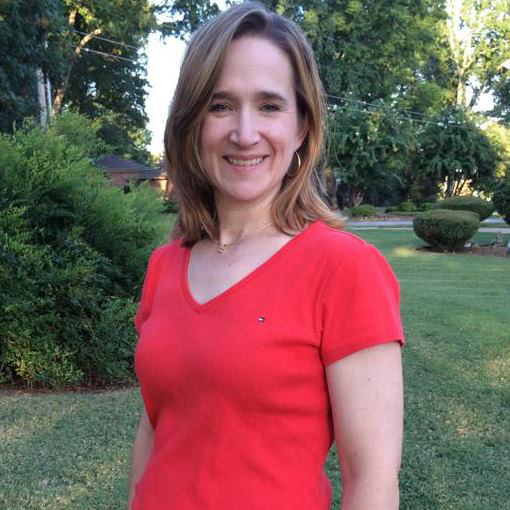 Try again.” Mom and I almost choked on our tongues when he sweetly asked for her stethoscope. LOOK HOW PINK HE WAS! This was less than 18 hours after his surgery. It was weird to see him so pink after he had been so pale for so long. 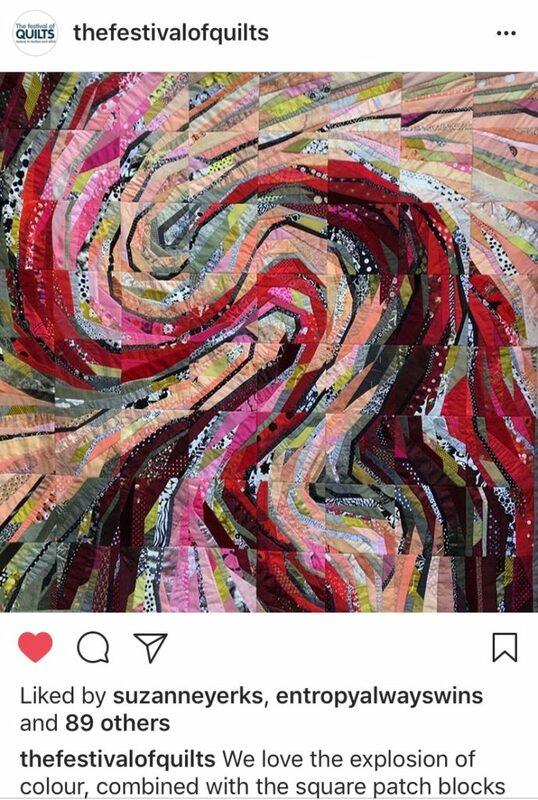 I sketched a quilt idea in my bullet journal inspired by watching dad “pink up” after his surgery, as well as a few quotations that I had seen around the Clinic. I wanted to capture the idea of blood flow getting halted through a blocked valve, but ultimately decided I’d rather just celebrate the unblocked flow and ignore what had preceded it. I like how the improvisational piecing in Kern’s work is broken by the strong lines of how the blocks or sections are pieced together. I love improvisational work, but I like the structure that strong block lines can provide to keep things from looking too erratic, and I wanted to include that in my design. I also love the work of Ann Brauer, for many of the same reasons. I liked the fluidity of her color progressions and wanted to capture that effect as much as possible too. So… I let the idea sit in the back of my mind for over a year, while I improved my improvisational skills and continued to learn new techniques. And Dad was doing well, back to his usual pink self. We even had a very cold Thanksgiving the next year in rural Virginia. 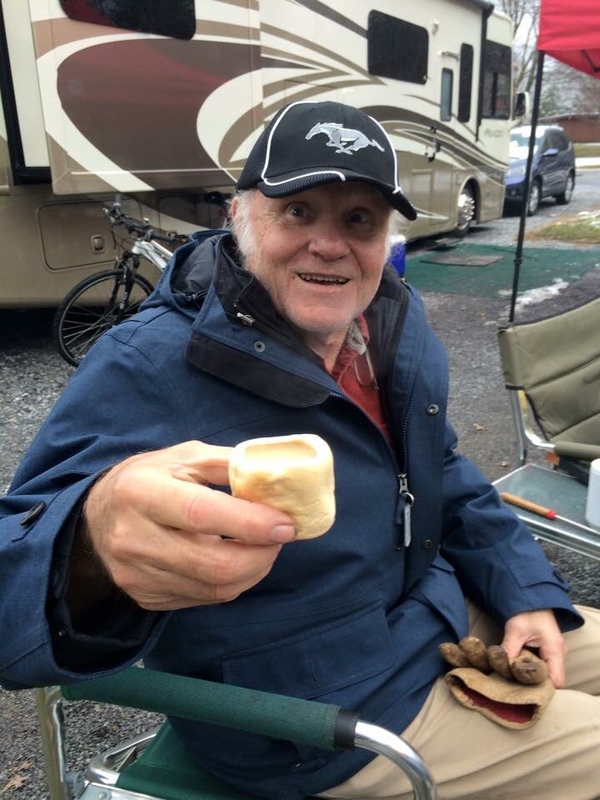 Here’s Dad with a Bailey’s-filled marshmallow shot. It was good to have him back and spunky again. Social media is kind of the “fast food” of blogging and interactions online. I gave up blogging– without really meaning to do so– back in 2016, and spent my time posting little bites of life on Instagram. 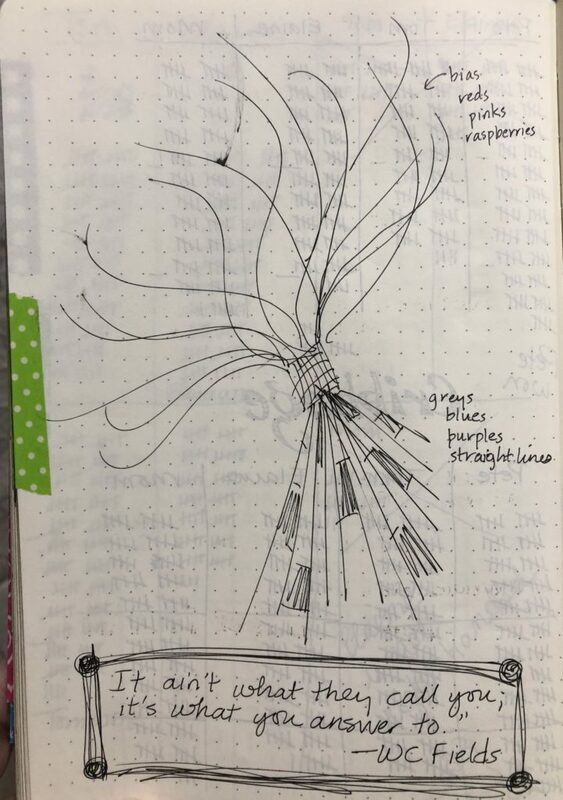 I have found that I miss the slower process of blogging, much because of the art journal it proved to be for me and my process. Not as many people comment on blogs as in the past, I guess because of Instagram and other quicker forms of social media. But blogging is as much for me and watching my growth as an artist as it is for the interaction. I need to bring that back into my life. My artistic explorations reached a high point in late 2017 and have sort of decreased over the past year. I think that the lack of documenting my process in longer narratives here has been part of that. So I’m preparing several posts for January now, and I hope you’ll join me. And I hope that I’ll resume the habit going forward, and perhaps see a creative burst come from lingering more intentionally with my work. Hopefully I’ll share more works in progress instead of only grand finishes. Maybe that’s why I lost interest– everything had to be so big and it was exhausting. I will start with some finished works that need to be documented, but in time I want to share more of my process, including the low points as well as the high points. As artists we all need to see that others experience the same ranges of emotions as we do, instead of hiding the struggles behind triumphs. 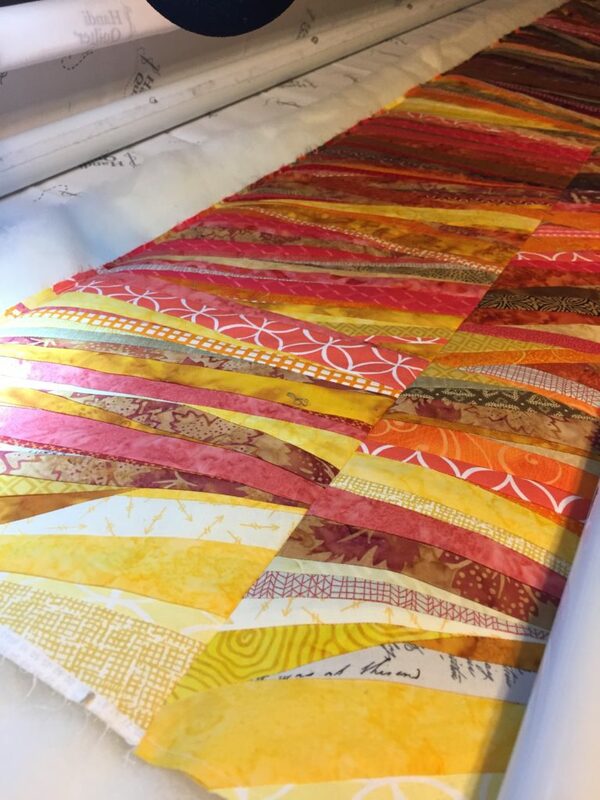 Author ElainePosted on December 26, 2018 December 26, 2018 Categories Quilting/Sewing9 Comments on 2019: Slowing Down?